Embraer SA ERJ recently secured a contract from United Airlines for delivering 25 of its E175 jets, in a 70-seat configuration. The deal will substantially expand the airlines’ existing fleet of almost 400 E-Jets and ERJ jets operating in the United Express network. At current list prices, the order is valued at $1.1 billion, which will be added to Embraer’s third-quarter 2018 backlog. The company will start delivering the jets from the second quarter of 2019. The latest transaction will take the total number of E175 jets sold by Embraer to North American airlines, since 2013, to more than 420. Together these contracts constitute more than 80% of all orders for the company, in the 70-76-seat jet segment. These new E-175 jets are expected to offer United Airlines’ travelers the latest technology in terms of onboard amenities and comfort. The E175 jets have a 76-seat dual class pattern, including 12 First Class seats, 16 Economy Plus seats and 48 Economy seats. It also features a wingtip for enhanced aerodynamic performance. Moreover, this new fleet of the model is 6.4% more fuel efficient than the first-generation E175s. Over the last few years, Embraer has been able to grab the lion’s share of 80% of orders for airplanes in its class from airline companies in the United States. We note that Embraer is the only company that manufactures a family of four airplanes for the 70-to-130 seat segment. The first E-Jet entered into revenue service in 2004, since then the E-Jets family has received more than 1,800 orders and over 1,400 aircraft have been delivered. Currently, E-Jets are flying in the fleet of 70 customers in 50 countries. This surely reflects the widely accepted popularity of these jets and the latest delivery order is an evidence to that. Also, Embraer released its jet market outlook that projects demand for 10,550 new aircraft with up to 150 seats worldwide, worth $600 billion, over the next 20 years. The company too forecasted the in-service fleet to increase from 9,000 aircraft currently operating to 16,000 jets. Considering such flamboyant outlook for aircraft market, we can expect Embraer to win more such contracts involving delivery of its versatile jets. This, in turn, might boost the company’s prospects in the future. 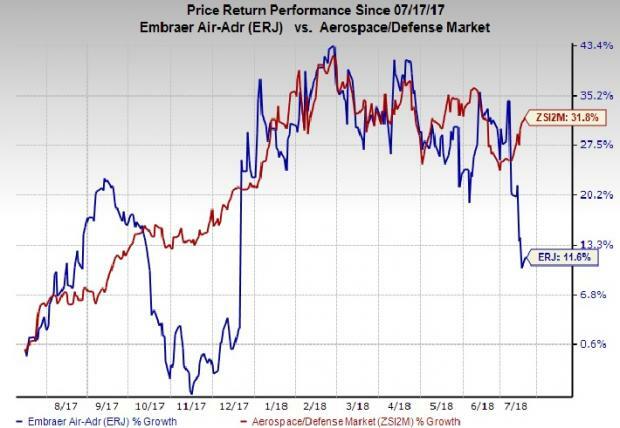 In a year’s time, shares of Embraer have gained 11.6% compared with the industry‘s 31.8% rally. This underperformance may have been caused by the softness observed in the company’s Defense and Security business. Embraer currently has a Zacks Rank #3 (Hold). A few better-ranked stocks in the same space are Northrop Grumman NOC, Lockheed Martin LMT and Engility Holdings EGL. While Northrop Grumman sports a Zacks Rank #1 (Strong Buy), Lockheed and Engility Holdings carry a Zacks Rank #2 (Buy). You can see the complete list of today’s Zacks #1 Rank stocks here. Northrop came up with an average positive earnings surprise of 13.87% in the last four quarters. The Zacks Consensus Estimate for 2018 earnings climbed 6.5% to $16.61 in the last 90 days. Lockheed Martin came up with an average positive earnings surprise of 7.45% in the last four quarters. The Zacks Consensus Estimate for 2018 earnings moved north 3.7% to $16.09 in the last 90 days. Engility Holdings came up with an average positive earnings surprise of 15.08% in the last four quarters. The Zacks Consensus Estimate for 2018 earnings moved up 0.5% to $1.91 in the last 90 days.